Apple’s iMessage reveal may have shocked some wireless providers, especially AT&T. Gruber himself noted that he plans on cancelling his current plan when iMessage launches alongside iOS 5 this Fall. Wireless carriers bring in substantial revenue from SMS plans, so they probably aren’t too happy about iMessage. 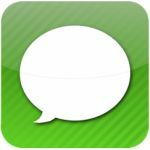 Plenty of people will be lowering their SMS plan once iMessage is released, and some will probably cancel it entirely. Plenty of people have iPhones or utilize Google Talk, so it really is pointless to pay for outrageously priced SMS plans, especially when some people are already paying for unlimited data.